We’ve lived and gardened here for ten years, you’d think we’d know all there is to know about the tricks weather and light can play. But once in a while there’s a surprise in store that sends me hurtling from the house to see how the garden has responded. Last Friday morning was one such time, as I drew the curtains I knew that this was going to be a very special morning. Never mind Scotch Mist, in the beautiful South Wales ribbon valleys there’s a phenomenon called ‘the dragon’s breath’ where snaking mist hangs low in the early morning, trapped then eerily funnelled by the valley sides. Here in the narrower Lower Wye Valley we don’t expect to see it quite so much, perhaps just a hint in autumn. Even when conditions are forecast to be at their best, it’s an elusive beauty requiring : high humidity, unusually gentle overnight westerly rain; and, lastly, crystal clear skies above cool early morning ground temperatures. It’s understandable that capturing the perfect image of the dragon in action is a bit of a holy grail among photographers. “Secret Britain : Series 2 ‘Water World of Wales’ “, an excellent series in itself, contains a fascinating clip of one beguiled man’s quest to do just this. 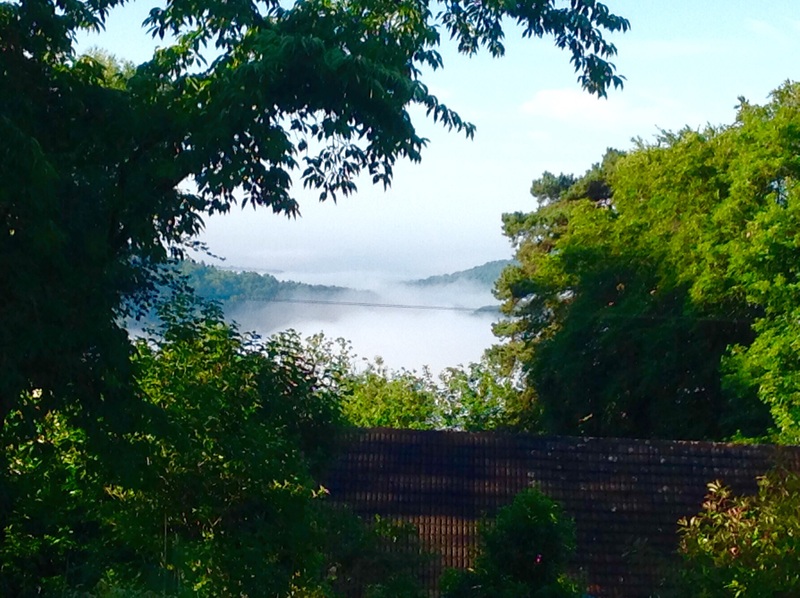 So, when I saw the tail end of the quirky mist hovering in the valley below how I could resist? The platform at the top of the old apple barn steps always makes a good vantage point. Though precariously steep, the steps lead nicely from the bedroom to the front garden. I often pause here to check out what’s going on in the garden below. 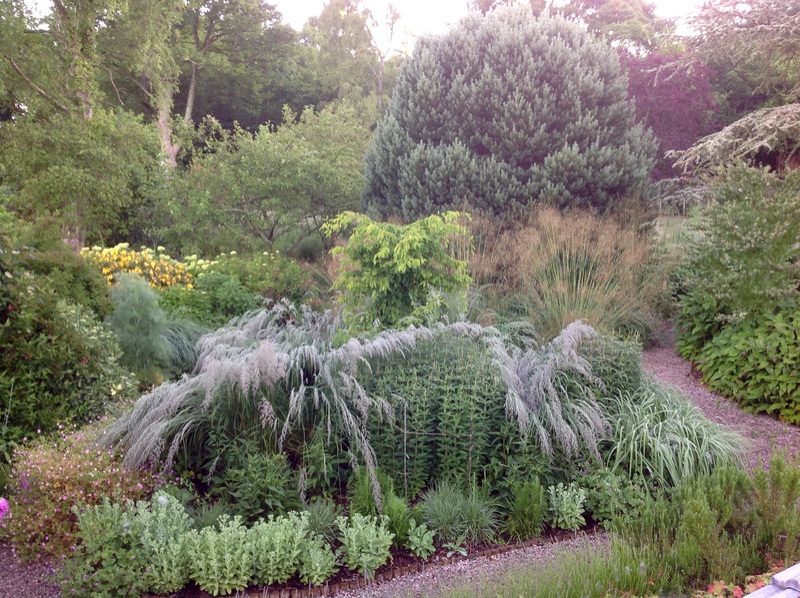 I was greeted by a very special scene, what I saw looked more like a ghostly seascape, and, in all these years of growing calamagrostis, it was something new to me, Effectively the mist rolling through the garden left ethereal grey dew just weighty enough to make the grasses heave in the most peculiar way. 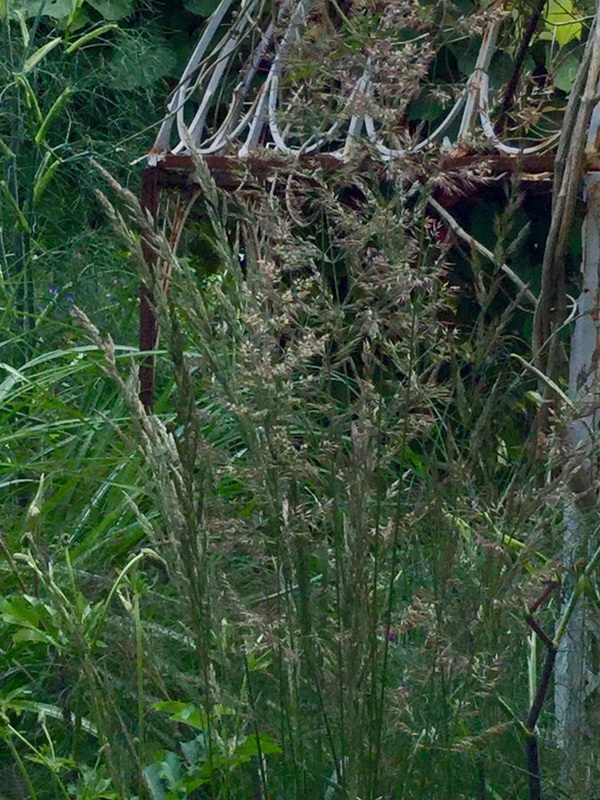 Heavy headed themselves with panicles poised at flowering point these grasses can ‘lodge’ or lean when wet, but this was different from their usual summertime sighs. 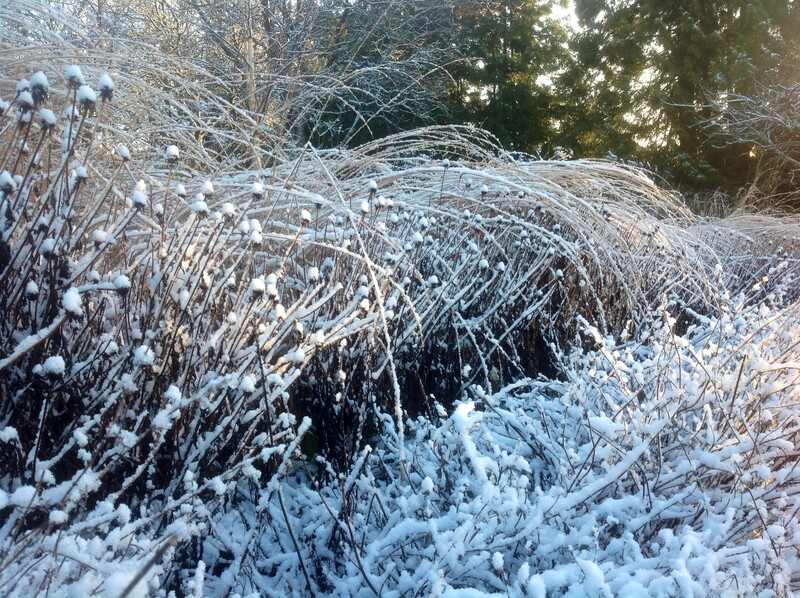 What it it did remind me of was what the terrace of grasses looked like back in February after a smattering of wet snow one morning. The Round Bed at the back of the house has turned out to be a weather turning circling, it always fares worst or best, whichever way you choose to look at it. 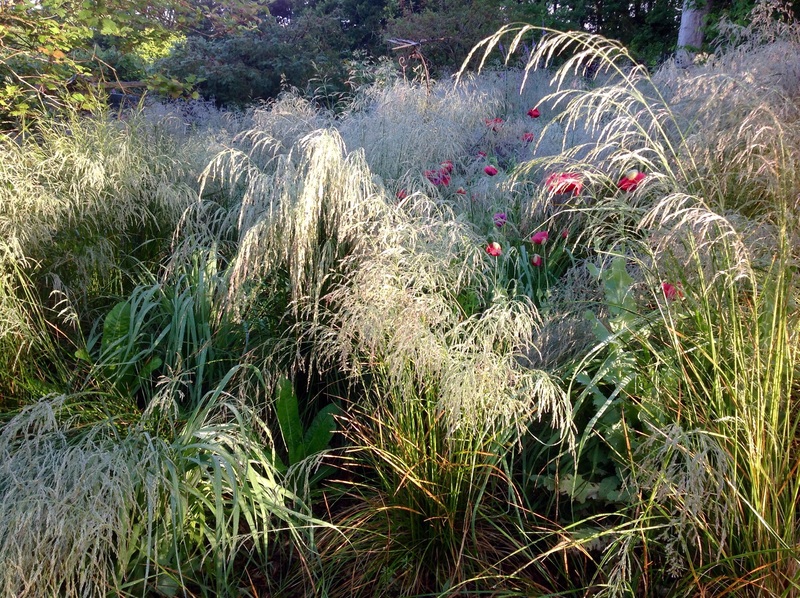 I’ve grown not to mind too much because I know Calamagrostis x acutiflora is an incredibly supple athlete, despite the listing look there really is no cause to panic. Remarkably they do dry off and pick themselves up with good grace, and, quite quickly too. The only way to hasten the process is to pray for a dry spell, preferably accompanied by light winds. I learnt long ago that stirring wet grasses with a long stick does not help … it’s the equivalent of trying to knit with wet wool. Grown subtly as part of a naturalistic planting in a more sheltered spot avoids this potential problem. But, I think where grown en masse in exposed sites it’s wise to know what to expect. To the grassy minded it may even be considered charming that they behave like this. However, I can imagine that for some this characteristic particular to grasses with tall slender flowering stems might make it worth pondering how best to locate, space and partner them. I mean, would you want these feathery delights rubbing shoulders with your prize delphiniums? 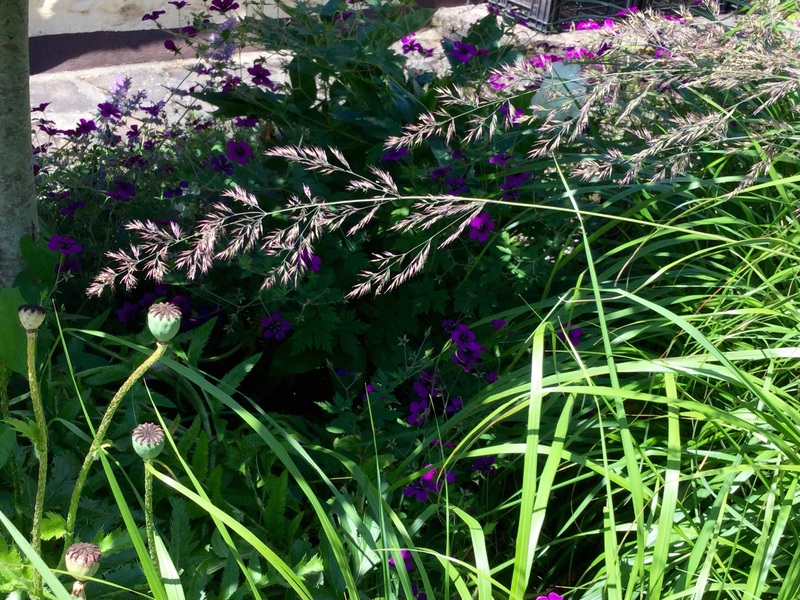 I tend to stick to stout perennials, here self supporting fennel, and, in the awkward round bed, tall veronicastrum (itself supported with canes and twine). Both lend the grasses a helping hand. And, although more hands might be helpful, in a funny sort of way, I actually like the sight of a few overly dense clumps splaying as they do when densely planted. Sometimes combinations work, sometimes they don’t. I learn as I go along, things do wrong from time to time, sometimes the air is veritably blue. It simply teaches me to marvel all the more when things go right. 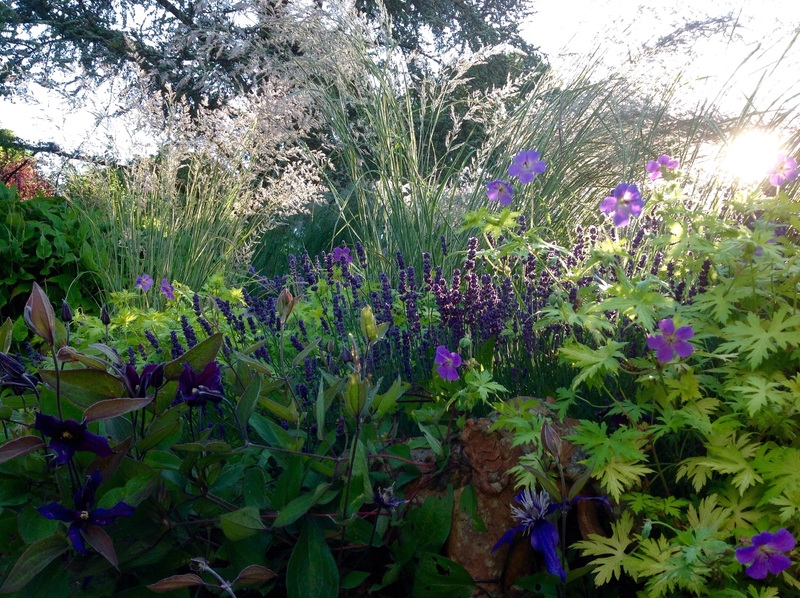 Here’s a bit of a hotchpotch where a leftover sliver of Calamagrostis x acutiflora ‘Karl Foerster’ has popped up unplanned among the sprawling Geranium ‘Ann Thomson’, one of my favourite long flowering, dark eyed beauties. 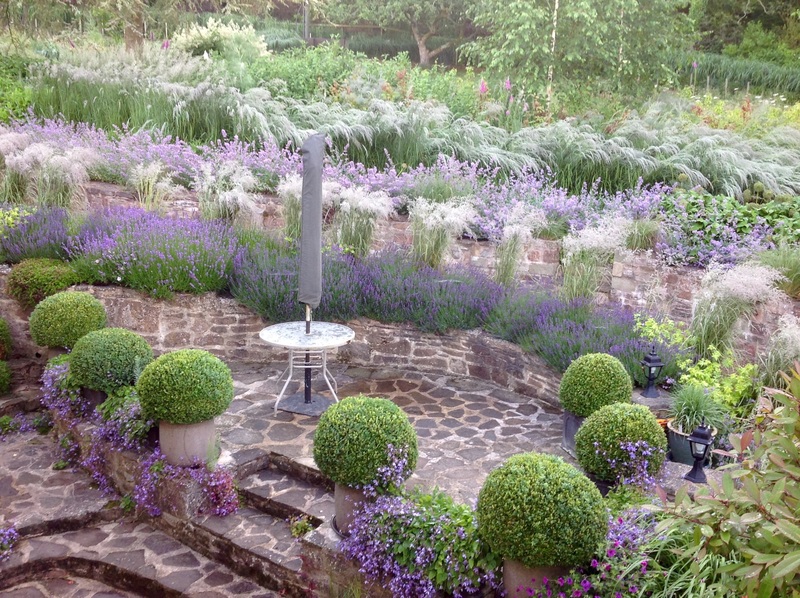 Quite clearly, the sentries of Calamagrostis xacutiflora ‘Overdam’ spaced generously at a metre apart to punctuate the lower terrace behaved differently, with room to arch elegantly in almost perfect circles. C. ‘Overdam’ does dry out more quickly, perhaps also due to it being a foot shorter than its forebear ‘Karl Foerster’ as much as the spacing? The seed raised stylised meadow currently studded with the red annual poppy Papaver somniferum has been joy enough so far this year. But, what I saw last Friday simply took my breath away. This is the gloriously feathery Descahmpsia cespitosa, a graceful native grass in fresh flower, yet, I couldn’t have imagined it looking this gorgeous glittering as it was in the astonishing light. Who needs diamonds? Or rubies? 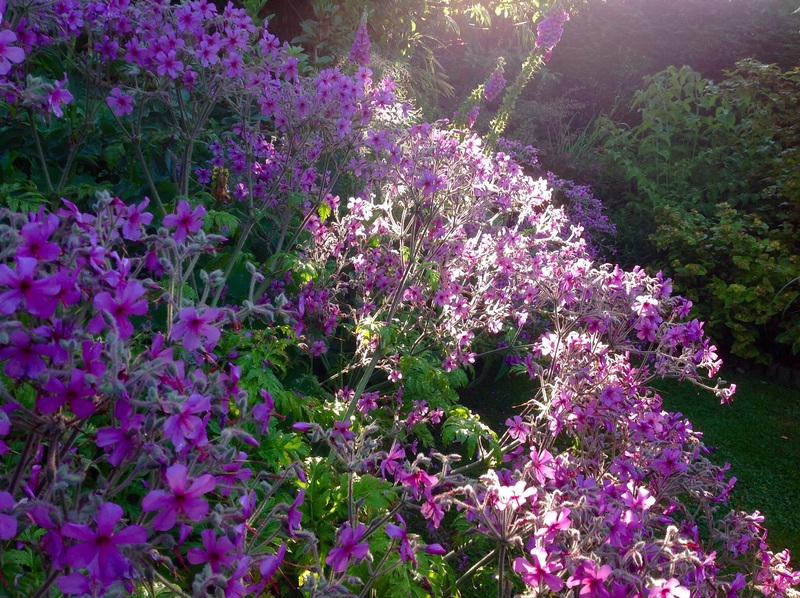 When I’m lucky enough to revel in Geranium palmatum. And, forget about lustrous pearls. The filigree flowers of Nassella tenuissima are adornment enough, for me. All the the bling I could ever desire, was right here for one magical misty morning in early July. For a few precious hours the garden became a treasure trove, all thanks to the dragon’s breath. What a lovely description of the grass and veronicastrum! It does get confusing when plants change their names, doesn’t it? A few years ago I rushed out to buy this not-new-but-renamed grass, only to discover I’d already got it as ‘Stipa’. Maybe it’s easier to stick to the poetic common names? We get the mists here in the valley we overlook, usually in autumn, but I’d never heard it called Dragon’s breath, that perfectly describes it! 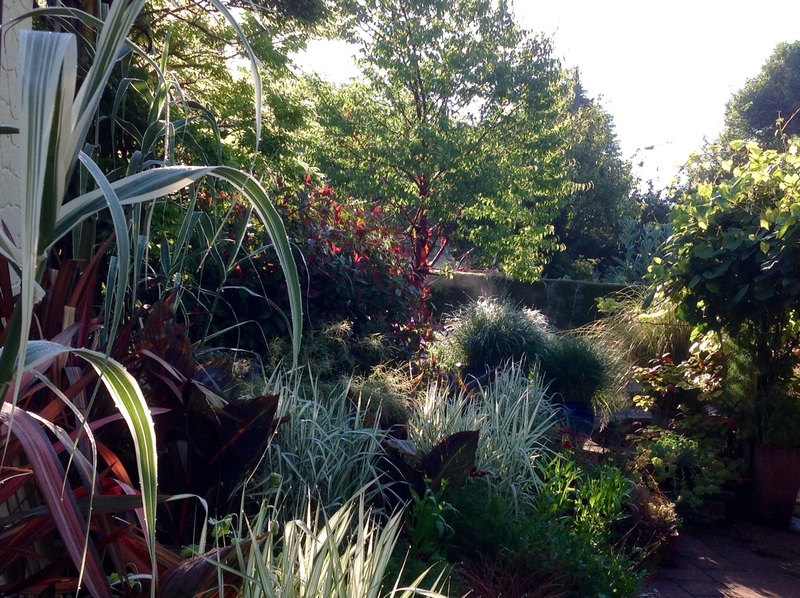 Love your garden – the grasses look wonderful, especially bejewelled by the water droplets that you captured. Everything here is bowed to the ground at the minute with rain drops – I’m hoping the stems don’t break under the pressure! 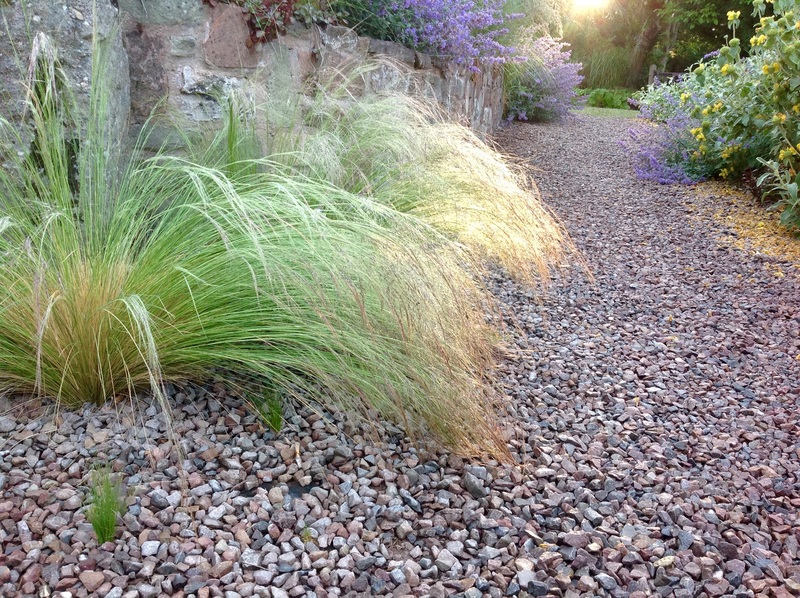 That’s the marvel – these grasses do pick themselves up just as gracefully! It did take me a while to figure it all out … hence the stirring stick. Sounds like you’re fairly close by then?